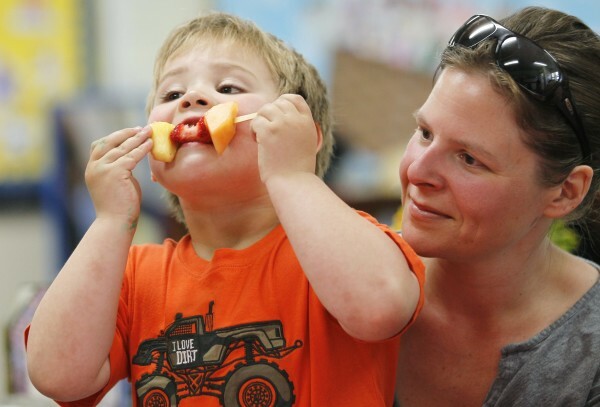 Jack Robinett, a 4-year-old student at the Lookout Mountain Preschool, eats a fruit kabob with his mother, Molly, at a healthy school party for mother's day in Golden, Colorado, on May 10, 2012. Some of Maine’s youngest children have such challenging behavior that those who teach and look after them see few options other than expelling them before they even reach school age. A new survey of Maine child care providers conducted by the National Center for Children in Poverty, at the Maine Legislature’s urging, shows how widespread challenging behaviors are among the young children enrolled in child care centers and prekindergarten programs. And it sheds light on the services and training that child care professionals say are missing as they struggle to help these children. These behaviors have consequences, the survey shows, from affecting a teacher’s ability to attend to other children to affecting the ability of other children to learn and explore to endangering other children’s safety — effects that can leave child care providers with few options. Ten percent of child care providers represented in the survey said they had told parents to withdraw a disruptive child. Fifteen percent said they and parents had agreed to unenroll a disruptive child. The same percentage said parents had withdrawn their children because of the disruptive behaviors of other children. While child care expulsions aren’t uniformly and regularly tracked, there’s evidence they’re more common in Maine than elsewhere. In 2005, a Yale University researcher found that Maine reported the second highest rate nationally of pre-K expulsions — 14.73 for every 1,000 children, a rate 21.5 times greater than the state’s K-12 expulsion rate. Expulsions set up children for failure, and especially so at a very young age. In the short term, they often end up in informal, less educational child care settings. In the long term, research shows that young children who are expelled or suspended are 10 times more likely to fall behind in school, drop out of high school and face incarceration. In other words, an expulsion can seal the fate of a young child already experiencing difficulty in life. Indeed, Maine child care providers said large percentages of their students with behavior problems come from homes in which they’ve witnessed substance use, domestic violence and mental health challenges. Many come from families in financial distress. Others are in foster care or homeless. So what is a child care professional to do in a seemingly impossible situation that affects the ability of all students to learn? Representatives from 60 percent of the child care centers surveyed said they wanted more opportunities for training on how to address challenging behaviors and promote their students’ social-emotional growth. Fifty-five percent wanted more access to specialists who can help them address challenging behaviors. There’s evidence that what Maine child care providers and pre-K educators want is actually what works. Connecticut in recent years has made it a priority, using child welfare funds in the state budget, to make mental health professionals available to child care providers. A recent study evaluating child care centers that had taken advantage of the service against those that hadn’t showed that the child care centers using the professional support reported significant declines in challenging behaviors. A common complaint among the Maine child care providers was that such support wasn’t easily available. “Our mental health specialist … is the only one that serves our entire population … multiple towns throughout the state,” noted one respondent. If a mental health expert’s intervention in Connecticut proved so helpful in turning around behavior problems, it shows that Maine could reap rewards from making a similar investment — if only the political will existed to make it. Maine can’t afford not to make essential investments in its youngest. It can’t afford to set them up for failure.